South African species F-G are found on this wiki page. 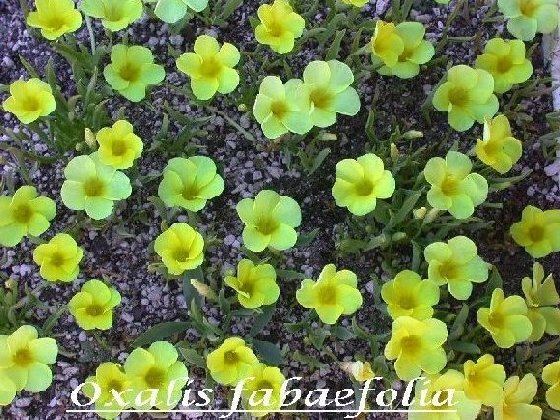 Oxalis fabaefolia is a species with a number of synonyms, O. asinina Jacq., O. crispa Jacq. and O. fabaefolia Jacq. var. crispa (Jacq.) Sond. In his doctorate K.C. 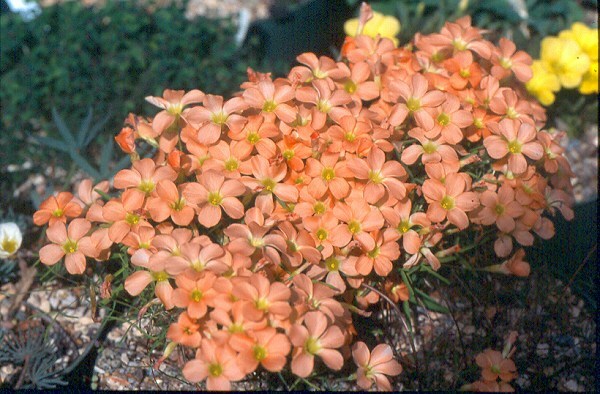 Oberlander (2009, pages 174-202) (also to be published in South African Journal of Botany) showed that morphological and molecular data place O. fabaefolia strongly within the Oxalis flava species group, and thus proposed that Oxalis fabaefolia should be considered as a variety of O. flava as Oxalis flava var. 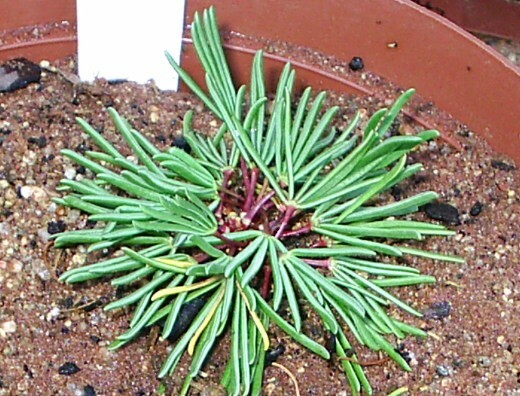 fabaefolia. 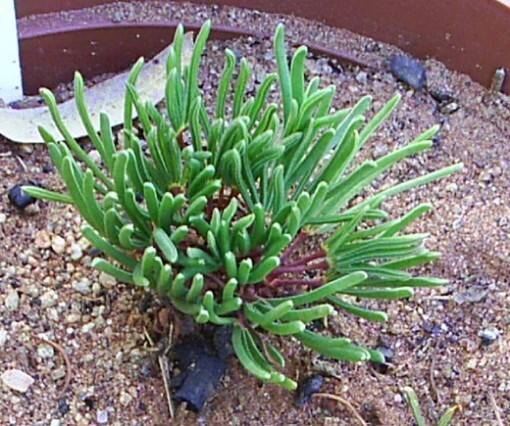 Plants sometimes called O. namaquana are really O. fabaefolia. 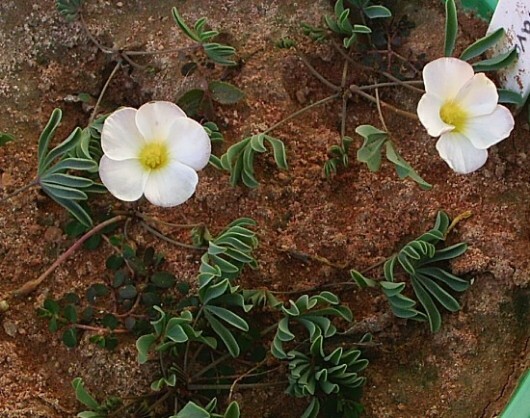 The leaflets of O. fabaefolia can be rather broad and have "wings", whereas the leaflets of O. namaquana tend to be narrow. Photos 1-2 were taken by Bill Dijk. Photo 3 taken by Christiaan van Schalkwyk shows this species in habitat from a colony outside Vanrhynsdorp. This is a three leaflet form with broad petiolate wings. 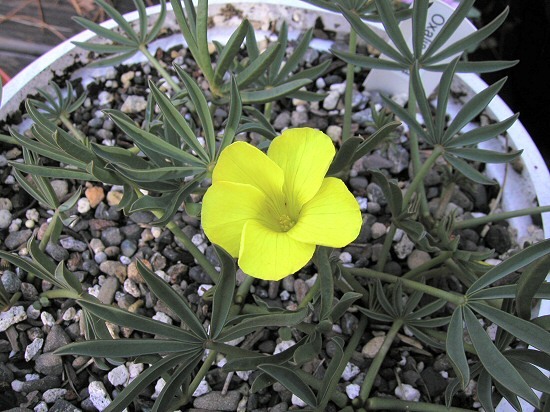 In this colony the flowers' colour included all the possibilities for this species: yellow, white and mauve. 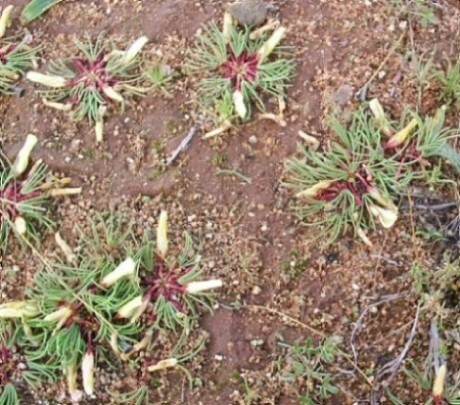 The photo was taken after flowering and after a very good rainfall season, both adding to the large size of this plant. 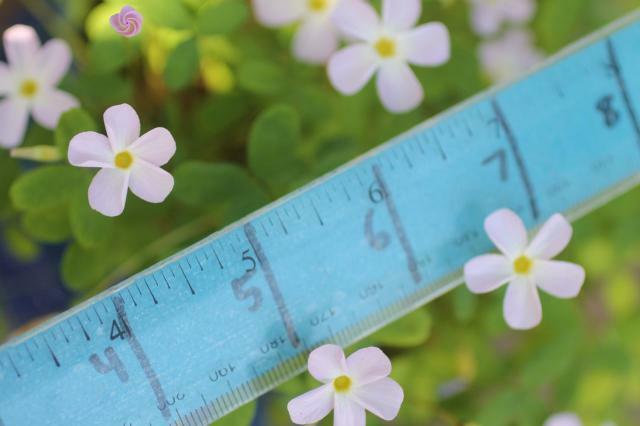 The photos below shows a form with narrow 2-leaflets leaves. Photos 1-2 were taken by Nhu Nguyen. Photos 3-5 were taken by Mary Sue Ittner. 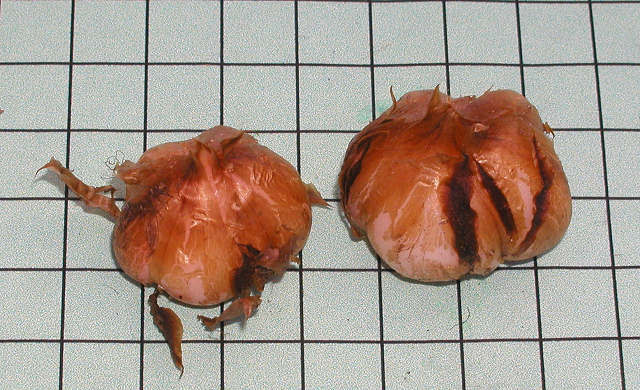 Photo 5 shows the bulbs on a 1 cm grid. 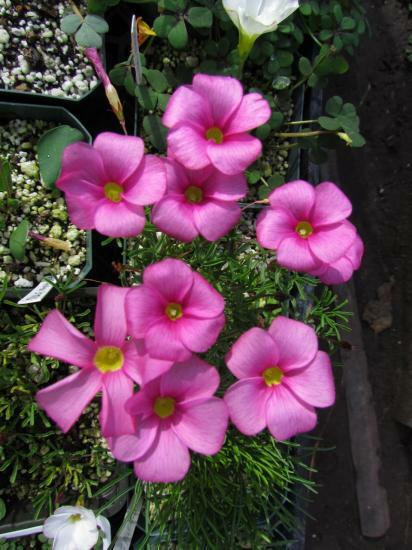 Oxalis flava is a fall blooming South African species-complex with solitary yellow, white or pink flowers found on sandy flats from Namaqualand southwards to the Cape Peninsula and eastwards to Riverdale. 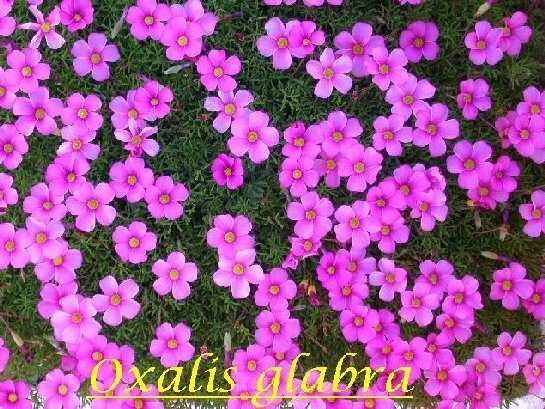 For more information and photos see the Oxalis flava page. Representative photos from Mary Sue Ittner, Bob Rutemoeller, and Christiaan van Schalkwyk are shown below. 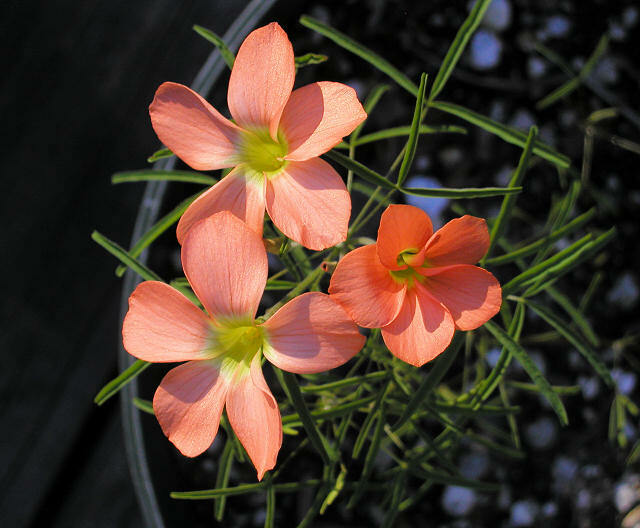 Oxalis flaviuscula var. 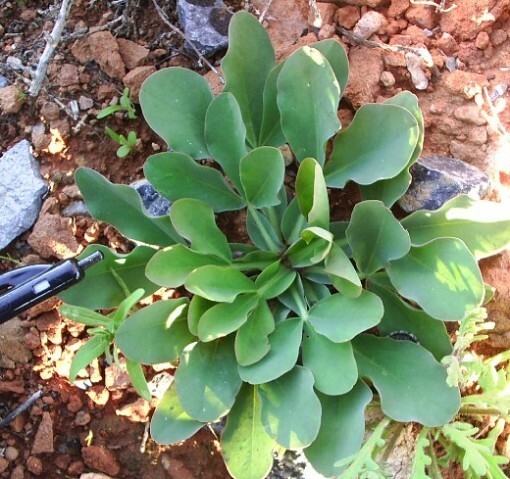 longifolia and the type variety are found in and around Steinkopf, Springbok and Kamieskroon in very hard clay soil. Var. flaviuscula occurs more in the north and west, while the south and eastern areas harbour the var. longifolia. 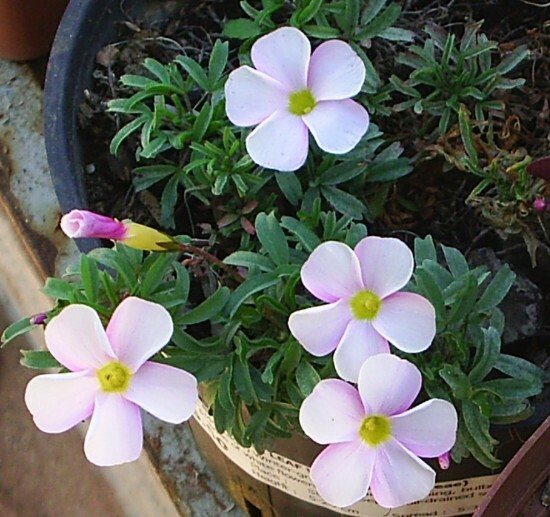 The difference between the two varieties are the size (larger in var. longifolia) and the red colour of the petioles in var. longifolia. The flowers are yellow and typical of the section Crassulae (which includes species like O. flava, O. fabaefolia and O. namaquana). 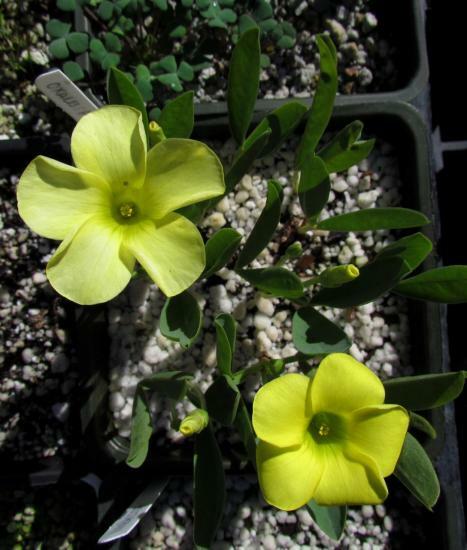 The first two pictures are from the same plant, the first taken in the morning, the second taken at noon, showing the folding of the leaves to conserve water during the day, and opening up at night to collect moisture. Similar leaf folding takes place in many other species. Photos by Christiaan van Schalkwyk. 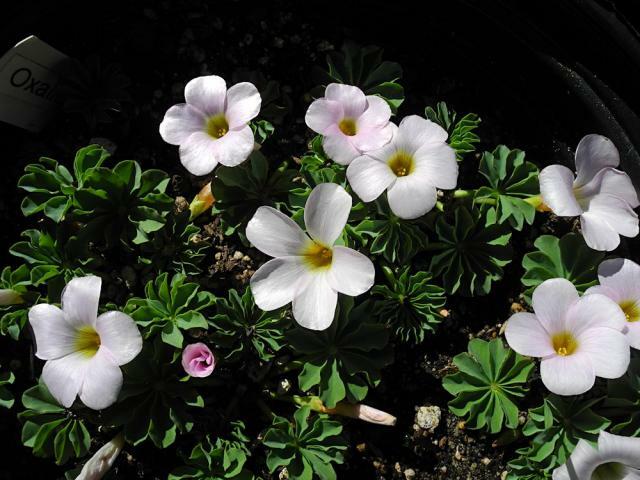 Oxalis fragrans This is what the latin would translate as "a naked name". 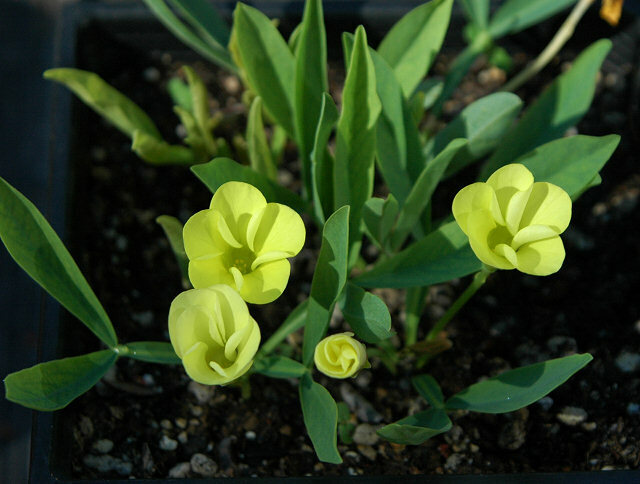 It is a manuscript name used by Dr. L. Dreyer in her thesis, and has not been validly described. 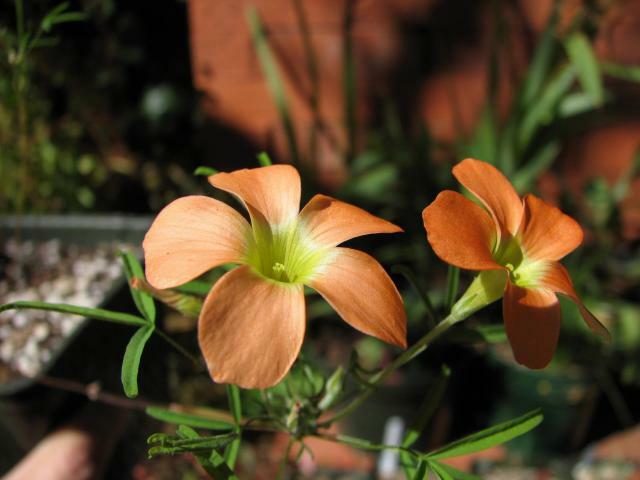 It was attributed to a species collected in the Karoo, fragrant and night blooming. It is supposed to belong to the section Pardales. 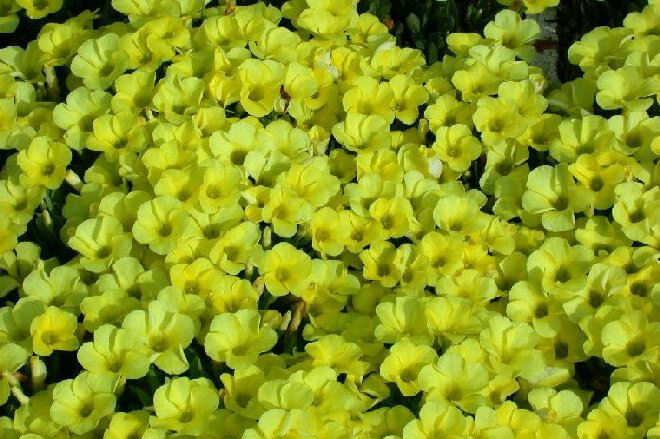 Plants seen and grown by me as Oxalis fragrans do not belong to this section, and are therefore not this species, even though it is fragrant and night blooming. Unfortunately at this stage I can offer no definite identification. If anyone have info. as to where it originated I’ll appreciate it. Apparently Michael Vassar received it from B.M., but thus far I'm unable to trace it. It might be an undescribed species, but without the locality data it is worthless. 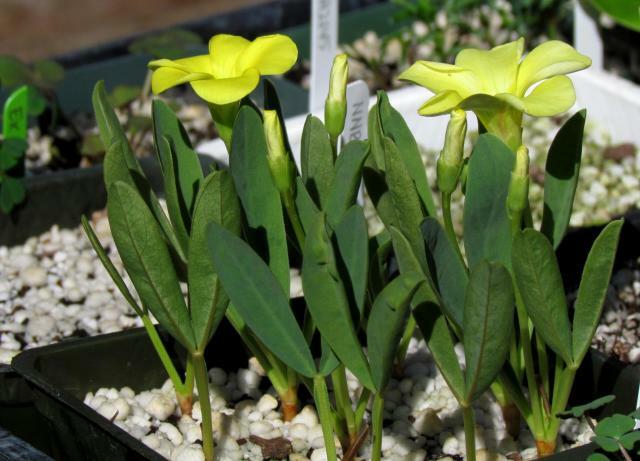 The first photo of this misnamed plant is by Christiaan van Schalkwyk. Photos 2-4 by M. Gastil-Buhl show bulbs on a 1 cm grid from Telos Rare Bulbs and the first year's flowers blooming in a 6 inch pot, late afternoon and early evening. These grow well crowded and doubled in number the second year. The fragrance is subtle and sweet. 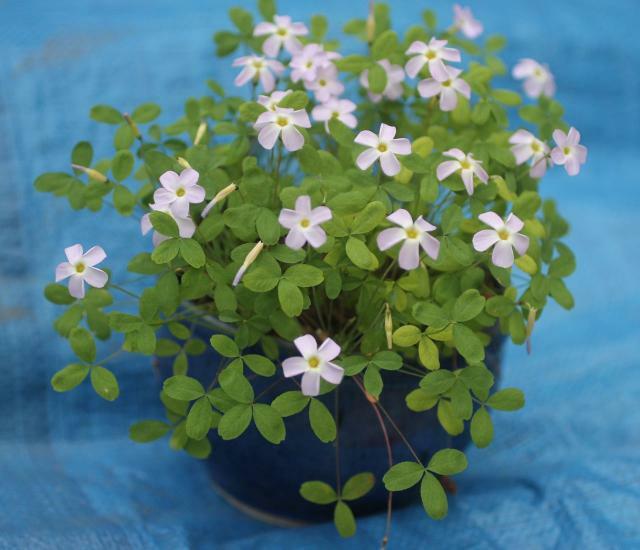 Oxalis glabra produces tiny bulbs, but a great number of them very quickly. 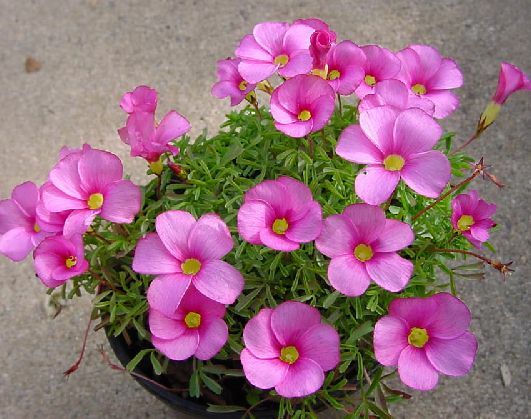 These small bulbs sprout into large plants that produce wonderfully large and showy flowers. 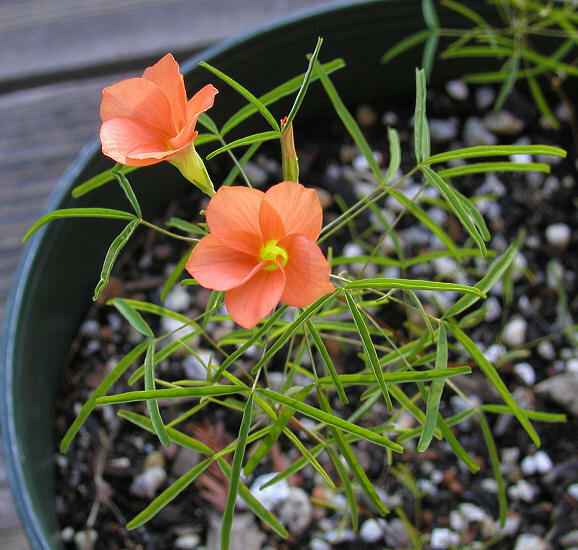 Caution may be required when growing this plant as it has the potential to escape. It blooms in autumn. Photo 1 by Lyn Edwards, photo 2 by Bill Dijk, and photos 3-4 by Nhu Nguyen. 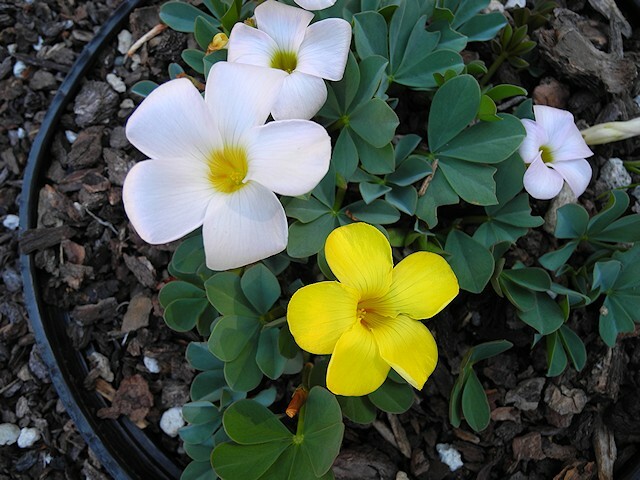 Photo 4 shows this plant next to Oxalis callosa. 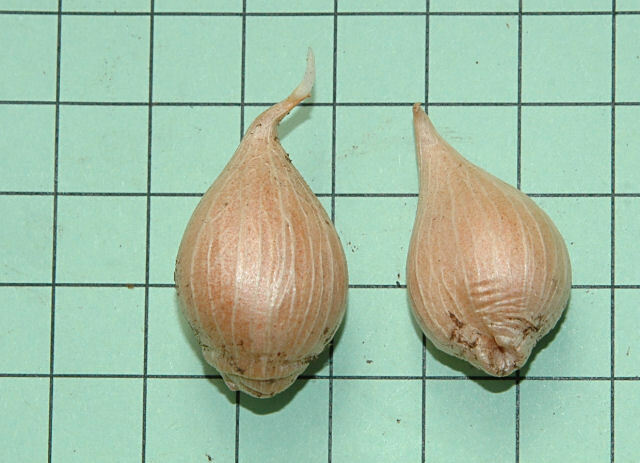 The last two photos were taken by Mary Sue Ittner and include a photo of the tiny bulbs on a 1 cm grid. 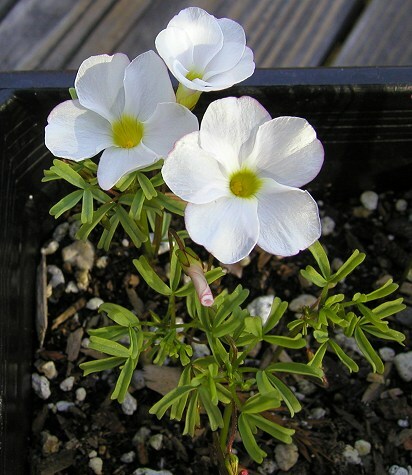 Oxalis glabra white. 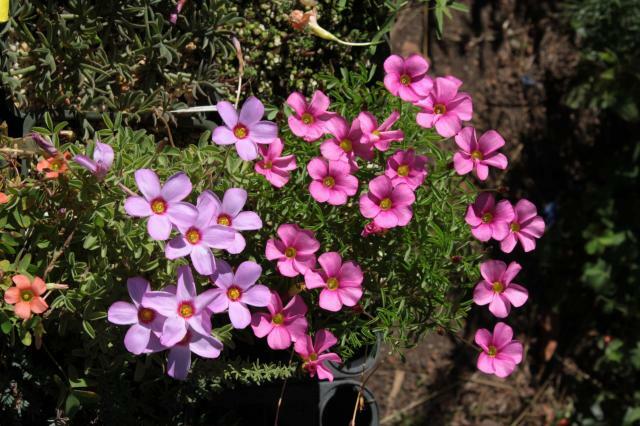 These plants were obtained from Kirstenbosch National Botanical Garden, sometimes showing a tinge of pink. Photo by Christiaan van Schalkwyk. 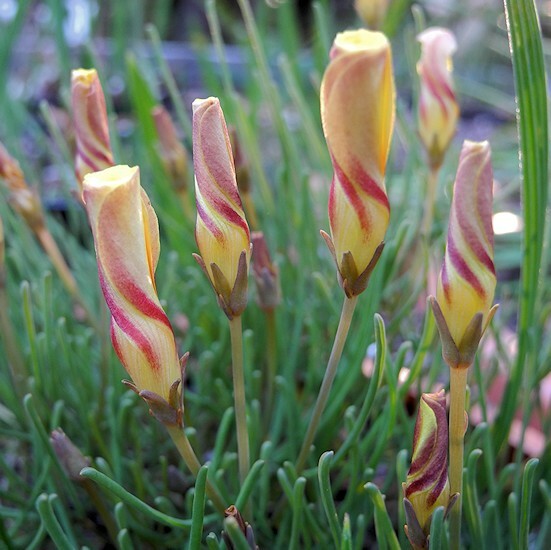 Oxalis goniorhiza is a winter blooming species usually found in damp marshy places. 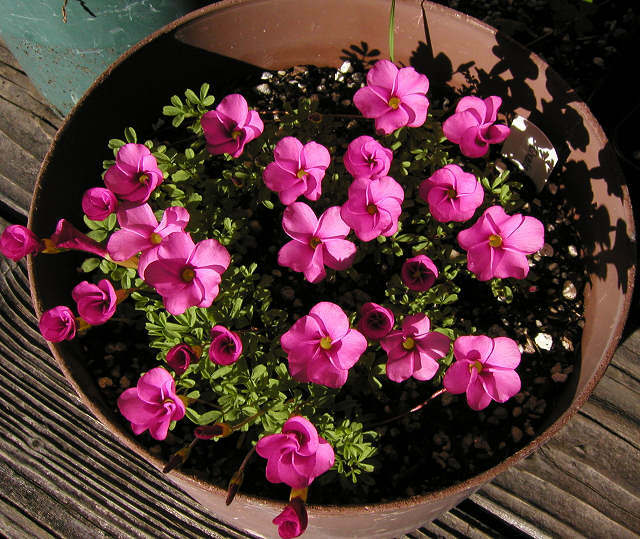 It has white flowers with reddish-purple margins. 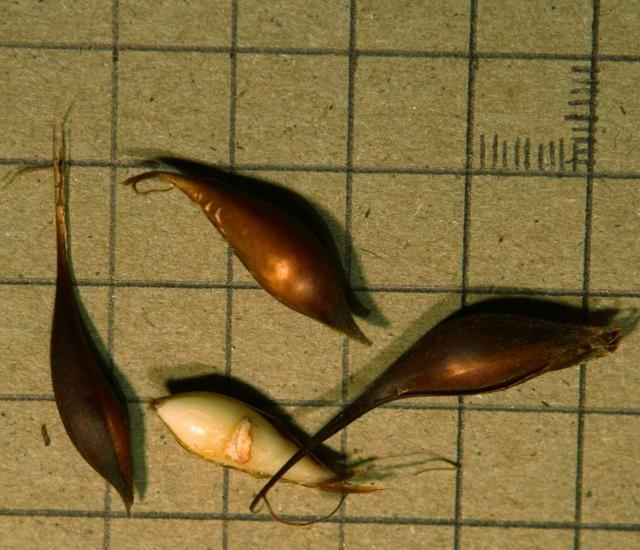 These photos taken by Mary Sue Ittner are of bulbs purchased from Telos Rare Bulbs blooming January 2004. 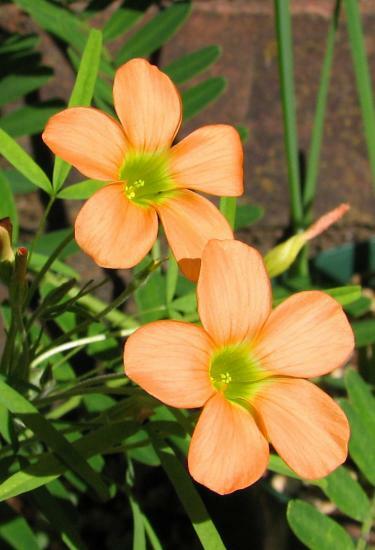 Oxalis gracilis is a species of the northwest Cape (Namaqualand to Clanwilliam). 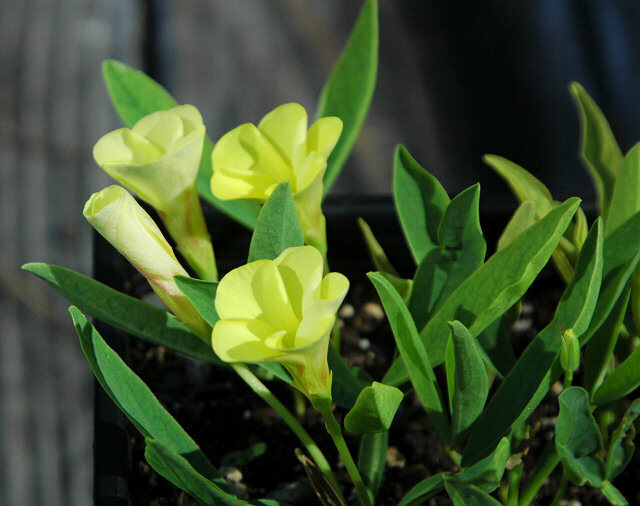 It grows on sandy flats and slopes and has trifoliolate linear leaves and apricot-pink or white flowers with a yellow tube. 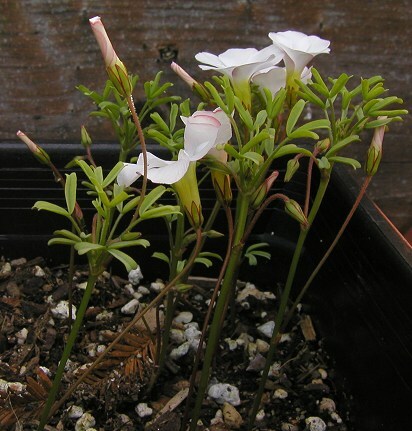 Plants grown under the name of Oxalis karooica with red stems and finely dissected leaves appear to be this species. 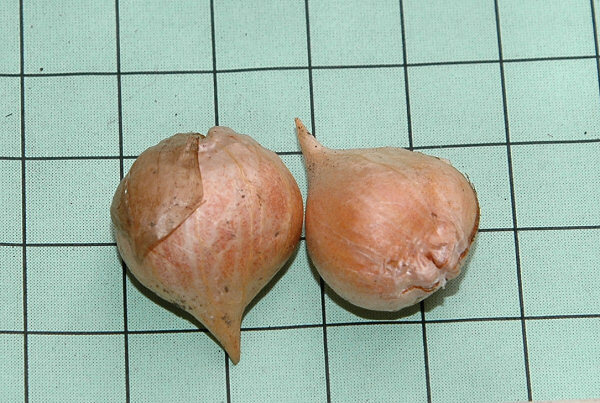 The bulbs can be large, but are slow to multiply. Photo 1 was taken by Andrew Wilson, photos 2-3 were taken by Nhu Nguyen. Photos 4-6 were taken by Mary Sue Ittner. 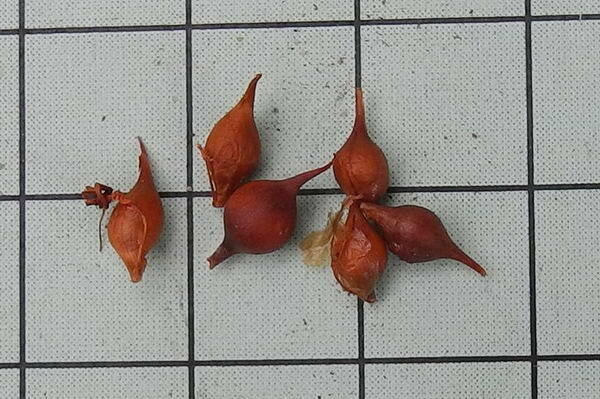 Photo 6 shows the bulbs on a 1 cm grid.